Cosmic rays are immensely high-energy radiation, mainly originating outside the Solar System. They may produce showers of secondary particles that penetrate and impact the Earth's atmosphere and sometimes even reach the surface. Composed primarily of high-energy protons and atomic nuclei, they are of mysterious origin. Data from the Fermi space telescope (2013) have been interpreted as evidence that a significant fraction of primary cosmic rays originate from the supernovae of massive stars. However, this is not thought to be their only source. Active galactic nuclei probably also produce cosmic rays. The term ray is a historical accident, as cosmic rays were at first, and wrongly, thought to be mostly electromagnetic radiation. In common scientific usage high-energy particles with intrinsic mass are known as "cosmic" rays, and photons, which are quanta of electromagnetic radiation (and so have no intrinsic mass) are known by their common names, such as "gamma rays" or "X-rays", depending on their frequencies. Cosmic rays attract great interest practically, due to the damage they inflict on microelectronics and life outside the protection of an atmosphere and magnetic field, and scientifically, because the energies of the most energetic ultra-high-energy cosmic rays (UHECRs) have been observed to approach 3 × 1020 eV, about 40 million times the energy of particles accelerated by the Large Hadron Collider. At 50 J, the highest-energy ultra-high-energy cosmic rays have energies comparable to the kinetic energy of a 90-kilometre-per-hour (56 mph) baseball. As a result of these discoveries, there has been interest in investigating cosmic rays of even greater energies. Most cosmic rays, however, do not have such extreme energies; the energy distribution of cosmic rays peaks at 0.3 gigaelectronvolts (4.8×10−11 J). Of primary cosmic rays, which originate outside of Earth's atmosphere, about 99% are the nuclei (stripped of their electron shells) of well-known atoms, and about 1% are solitary electrons (similar to beta particles). Of the nuclei, about 90% are simple protons, i. e. hydrogen nuclei; 9% are alpha particles, and 1% are the nuclei of heavier elements. A very small fraction are stable particles of antimatter, such as positrons or antiprotons. The precise nature of this remaining fraction is an area of active research. An active search from Earth orbit for anti-alpha particles has failed to detect them. After the discovery of radioactivity by Henri Becquerel and Marie Curie in 1896, it was generally believed that atmospheric electricity, ionization of the air, was caused only by radiation from radioactive elements in the ground or the radioactive gases or isotopes of radon they produce. Measurements of ionization rates at increasing heights above the ground during the decade from 1900 to 1910 showed a decrease that could be explained as due to absorption of the ionizing radiation by the intervening air. In 1909 Theodor Wulf developed an electrometer, a device to measure the rate of ion production inside a hermetically sealed container, and used it to show higher levels of radiation at the top of the Eiffel Tower than at its base. However, his paper published in Physikalische Zeitschrift was not widely accepted. In 1911 Domenico Pacini observed simultaneous variations of the rate of ionization over a lake, over the sea, and at a depth of 3 meters from the surface. Pacini concluded from the decrease of radioactivity underwater that a certain part of the ionization must be due to sources other than the radioactivity of the Earth. Then, in 1912, Victor Hess carried three enhanced-accuracy Wulf electrometers to an altitude of 5300 meters in a free balloon flight. He found the ionization rate increased approximately fourfold over the rate at ground level. Hess also ruled out the Sun as the radiation's source by making a balloon ascent during a near-total eclipse. With the moon blocking much of the Sun's visible radiation, Hess still measured rising radiation at rising altitudes. He concluded "The results of my observation are best explained by the assumption that a radiation of very great penetrating power enters our atmosphere from above." 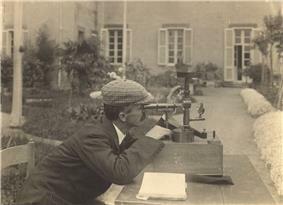 In 1913–1914, Werner Kolhörster confirmed Victor Hess' earlier results by measuring the increased ionization rate at an altitude of 9 km. 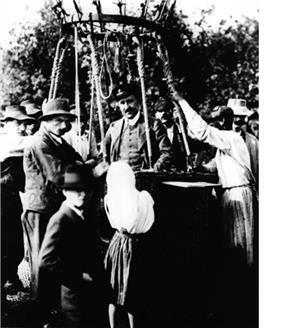 The Hess balloon flight took place on 7 August 1912. By sheer coincidence, exactly 100 years later on 7 August 2012, the Mars Science Laboratory rover used its Radiation Assessment Detector (RAD) instrument to begin measuring the radiation levels on another planet for the first time. On 31 May 2013, NASA scientists reported that a possible manned mission to Mars may involve a greater radiation risk than previously believed, based on the amount of energetic particle radiation detected by the RAD on the Mars Science Laboratory while traveling from the Earth to Mars in 2011-2012. In the 1920s the term "cosmic rays" was coined by Robert Millikan who made measurements of ionization due to cosmic rays from deep under water to high altitudes and around the globe. Millikan believed that his measurements proved that the primary cosmic rays were gamma rays, i.e., energetic photons. And he proposed a theory that they were produced in interstellar space as by-products of the fusion of hydrogen atoms into the heavier elements, and that secondary electrons were produced in the atmosphere by Compton scattering of gamma rays. But then, in 1927, J. Clay found evidence, later confirmed in many experiments, of a variation of cosmic ray intensity with latitude, which indicated that the primary cosmic rays are deflected by the geomagnetic field and must therefore be charged particles, not photons. In 1929, Bothe and Kolhörster discovered charged cosmic-ray particles that could penetrate 4.1 cm of gold. Charged particles of such high energy could not possibly be produced by photons from Millikan's proposed interstellar fusion process. In 1930, Bruno Rossi predicted a difference between the intensities of cosmic rays arriving from the east and the west that depends upon the charge of the primary particles - the so-called "east-west effect." Three independent experiments found that the intensity is, in fact, greater from the west, proving that most primaries are positive. During the years from 1930 to 1945, a wide variety of investigations confirmed that the primary cosmic rays are mostly protons, and the secondary radiation produced in the atmosphere is primarily electrons, photons and muons. In 1948, observations with nuclear emulsions carried by balloons to near the top of the atmosphere showed that approximately 10% of the primaries are helium nuclei (alpha particles) and 1% are heavier nuclei of the elements such as carbon, iron, and lead. Soviet physicist Sergey Vernov was the first to use radiosondes to perform cosmic ray readings with an instrument carried to high altitude by a balloon. On 1 April 1935, he took measurements at heights up to 13.6 kilometers using a pair of Geiger counters in an anti-coincidence circuit to avoid counting secondary ray showers. Measurements of the energy and arrival directions of the ultra-high energy primary cosmic rays by the techniques of "density sampling" and "fast timing" of extensive air showers were first carried out in 1954 by members of the Rossi Cosmic Ray Group at the Massachusetts Institute of Technology. The experiment employed eleven scintillation detectors arranged within a circle 460 meters in diameter on the grounds of the Agassiz Station of the Harvard College Observatory. From that work, and from many other experiments carried out all over the world, the energy spectrum of the primary cosmic rays is now known to extend beyond 1020 eV. A huge air shower experiment called the Auger Project is currently operated at a site on the pampas of Argentina by an international consortium of physicists, led by James Cronin, winner of the 1980 Nobel Prize in Physics from the University of Chicago, and Alan Watson of the University of Leeds. Their aim is to explore the properties and arrival directions of the very highest-energy primary cosmic rays. The results are expected to have important implications for particle physics and cosmology, due to a theoretical Greisen–Zatsepin–Kuzmin limit to the energies of cosmic rays from long distances (about 160 million light years) which occurs above 1020 eV because of interactions with the remnant photons from the big bang origin of the universe. Early speculation on the sources of cosmic rays included a 1934 proposal by Baade and Zwicky suggesting cosmic rays originating from supernovae. A 1948 proposal by Horace W. Babcock suggested that magnetic variable stars could be a source of cosmic rays. Subsequently in 1951, Y. Sekido et al. identified the Crab Nebula as a source of cosmic rays. Since then, a wide variety of potential sources for cosmic rays began to surface, including supernovae, active galactic nuclei, quasars, and gamma-ray bursts. Later experiments have helped to identify the sources of cosmic rays with greater certainty. In 2009, a paper presented at the International Cosmic Ray Conference (ICRC) by scientists at the Pierre Auger Observatory showed ultra-high energy cosmic rays (UHECRs) originating from a location in the sky very close to the radio galaxy Centaurus A, although the authors specifically stated that further investigation would be required to confirm Cen A as a source of cosmic rays. However, no correlation was found between the incidence of gamma-ray bursts and cosmic rays, causing the authors to set a lower limit of 10−6 erg cm−2 on the flux of 1 GeV-1 TeV cosmic rays from gamma-ray bursts. In 2009, supernovae were said to have been "pinned down" as a source of cosmic rays, a discovery made by a group using data from the Very Large Telescope. This analysis, however, was disputed in 2011 with data from PAMELA, which revealed that "spectral shapes of [hydrogen and helium nuclei] are different and cannot be described well by a single power law", suggesting a more complex process of cosmic ray formation. In February 2013, though, research analyzing data from Fermi revealed through an observation of neutral pion decay that supernovae were indeed a source of cosmic rays, with each explosion producing roughly 3 × 1042 - 3 × 1043 J of cosmic rays. However, supernovae do not produce all cosmic rays, and the proportion of cosmic rays that they do produce is a question which cannot be answered without further study. Primary cosmic rays primarily originate from outside the Solar System and sometimes even the Milky Way. When they interact with Earth's atmosphere, they are converted to secondary particles. The mass ratio of helium to hydrogen nuclei, 28%, is similar to the primordial elemental abundance ratio of these elements, 24%. The remaining fraction is made up of the other heavier nuclei that are nuclear synthesis end products, products of the Big Bang, primarily lithium, beryllium, and boron. These light nuclei appear in cosmic rays in much greater abundance (~1%) than in the solar atmosphere, where they are only about 10−11 as abundant as helium. There is no evidence of complex antimatter atomic nuclei, such as antihelium nuclei (i.e., anti-alpha particles), in cosmic rays. These are actively being searched for. A prototype of the AMS-02 designated AMS-01, was flown into space aboard the Space Shuttle Discovery on STS-91 in June 1998. By not detecting any antihelium at all, the AMS-01 established an upper limit of 1.1×10−6 for the antihelium to helium flux ratio. When cosmic rays enter the Earth's atmosphere they collide with molecules, mainly oxygen and nitrogen. The interaction produces a cascade of lighter particles, a so-called air shower secondary radiation that rains down, including x-rays, muons, protons, alpha particles, pions, electrons, and neutrons. All of the produced particles stay within about one degree of the primary particle's path. Cosmic rays impacting other planetary bodies in the Solar System are detected indirectly by observing high energy gamma ray emissions by gamma-ray telescope. These are distinguished from radioactive decay processes by their higher energies above about 10 MeV. In addition, the Earth's magnetic field acts to deflect cosmic rays from its surface, giving rise to the observation that the flux is apparently dependent on latitude, longitude, and azimuth angle. 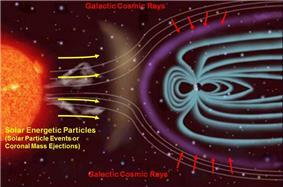 The magnetic field lines deflect the cosmic rays towards the poles, giving rise to the aurorae. The combined effects of all of the factors mentioned contribute to the flux of cosmic rays at Earth's surface. For 1 GeV particles, the rate of arrival is about 10,000 per square meter per second. At 1 TeV the rate is 1 particle per square meter per second. At 10 PeV there are only a few particles per square meter per year. Particles above 10 EeV arrive only at a rate of about one particle per square kilometer per year, and above 100 EeV at a rate of about one particle per square kilometer per century. In the past, it was believed that the cosmic ray flux remained fairly constant over time. However, recent research suggests 1.5 to 2-fold millennium-timescale changes in the cosmic ray flux in the past forty thousand years. The magnitude of the energy of cosmic ray flux in interstellar space is very comparable to that of other deep space energies: cosmic ray energy density averages about one electron-volt per cubic centimeter of interstellar space, or ~1 eV/cm3, which is comparable to the energy density of visible starlight at 0.3 eV/cm3, the galactic magnetic field energy density (assumed 3 microgauss) which is ~0.25 eV/cm3, or the cosmic microwave background (CMB) radiation energy density at ~ 0.25 eV/cm3. Comparison of Radiation Doses - includes the amount detected on the trip from Earth to Mars by the RAD on the MSL (2011 - 2013). Another method was developed by Robert Fleischer, P. Buford Price, and Robert M. Walker for use in high-altitude balloons. In this method, sheets of clear plastic, like 0.25 mm Lexan polycarbonate, are stacked together and exposed directly to cosmic rays in space or high altitude. The nuclear charge causes chemical bond breaking or ionization in the plastic. At the top of the plastic stack the ionization is less, due to the high cosmic ray speed. As the cosmic ray speed decreases due to deceleration in the stack, the ionization increases along the path. The resulting plastic sheets are "etched" or slowly dissolved in warm caustic sodium hydroxide solution, that removes the surface material at a slow, known rate. 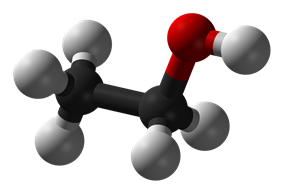 The caustic sodium hydroxide dissolves the plastic at a faster rate along the path of the ionized plastic. The net result is a conical etch pit in the plastic. The etch pits are measured under a high-power microscope (typically 1600x oil-immersion), and the etch rate is plotted as a function of the depth in the stacked plastic. Finally, the CMOS devices in pervasive smartphone cameras have been proposed as a practical distributed network to detect air showers from ultra-high energy cosmic rays (UHECRs) which is at least comparable with that of conventional cosmic ray detectors. The app, which is currently in beta and accepting applications, is CRAYFIS (Cosmic RAYs Found In Smartphones). Cosmic rays constitute a fraction of the annual radiation exposure of human beings on the Earth, averaging 0.39 mSv out of a total of 3 mSv per year (13% of total background) for the Earth's population. However, the background radiation from cosmic rays increases with altitude, from 0.3 mSv per year for sea-level areas to 1.0 mSv per year for higher-altitude cities, raising cosmic radiation exposure to a quarter of total background radiation exposure for populations of said cities. Airline crews flying long distance high-altitude routes can be exposed to 2.2 mSv of extra radiation each year due to cosmic rays, nearly doubling their total ionizing radiation exposure. Natural Air 1.26 0.2-10.0a 2.29 2.00 0.40 Primarily from Radon, (a)depends on indoor accumulation of radon gas. Internal 0.29 0.2-1.0b 0.16 0.40 0.40 Mainly from radioisotopes in food (40K, 14C, etc.) (b)depends on diet. Terrestrial 0.48 0.3-1.0c 0.19 0.29 0.40 (c)Depends on soil composition and building material of structures. Cosmic 0.39 0.3-1.0d 0.31 0.26 0.30 (d)Generally increases with elevation. Fallout 0.007 0 - 1+ - - 0.01 Peaked in 1963 with a spike in 1986; still high near nuclear test and accident sites. others 0.0052 0-20 0.25 0.13 0.001 Average annual occupational exposure is 0.7 mSv; mining workers have higher exposure. Cosmic rays have sufficient energy to alter the states of circuit components in electronic integrated circuits, causing transient errors to occur, such as corrupted data in electronic memory devices, or incorrect performance of CPUs, often referred to as "soft errors" (not to be confused with software errors caused by programming mistakes/bugs). This has been a problem in extremely high-altitude electronics, such as in satellites, but with transistors becoming smaller and smaller, this is becoming an increasing concern in ground-level electronics as well. Studies by IBM in the 1990s suggest that computers typically experience about one cosmic-ray-induced error per 256 megabytes of RAM per month. To alleviate this problem, the Intel Corporation has proposed a cosmic ray detector that could be integrated into future high-density microprocessors, allowing the processor to repeat the last command following a cosmic-ray event. Cosmic rays are suspected as a possible cause of an in-flight incident in 2008 where an Airbus A330 airliner of Qantas twice plunged hundreds of feet after an unexplained malfunction in its flight control system. Many passengers and crew members were injured, some seriously. After this incident, the accident investigators determined that the airliner's flight control system had received a data spike that could not be explained, and that all systems were in perfect working order. This has prompted a software upgrade to all A330 and A340 airliners, worldwide, so that any data spikes in this system are filtered out electronically. A role of cosmic rays directly or via solar-induced modulations in climate change was suggested by Edward P. Ney in 1959 and by Robert E. Dickinson in 1975. Despite the opinion of over 97% of climate scientists against this notion, the idea has been revived in recent years, most notably by Henrik Svensmark, who has argued that because solar variations modulate the cosmic ray flux on Earth, they would consequently affect the rate of cloud formation and hence the climate. Nevertheless, it has been noted by climate scientists actively publishing in the field that Svensmark has inconsistently altered data on most of his published work on the subject, an example being adjustment of cloud data that understates error in lower cloud data, but not in high cloud data. The 2007 IPCC synthesis report, however, strongly attributes a major role in the ongoing global warming to human-produced gases such as carbon dioxide, nitrous oxide, and halocarbons, and has stated that models including natural forcings only (including aerosol forcings, which cosmic rays are considered by some to contribute to) would result in far less warming than has actually been observed or predicted in models including anthropogenic forcings. Svensmark, being one of several scientists outspokenly opposed to the mainstream scientific assessment of global warming, has found eminence among the popular culture movement that denies the scientific consensus. Despite this, Svensmark's work exaggerating the magnitude of the effect of GCR on global warming continues to be refuted in the mainstream science. For instance, a November 2013 study showed that less than 14 percent of global warming since the 1950s could be attributed to cosmic ray rate, and while the models showed a small correlation every 22 years, the cosmic ray rate did not match the changes in temperature, indicating that it was not a causal relationship. There are a number of cosmic-ray research initiatives. ^ Sharma (2008). Atomic And Nuclear Physics. Pearson Education India. p. 478. ^ a b Ginger Pinholster (2013-02-13). "Evidence Shows that Cosmic Rays Come from Exploding Stars". ^ Dr. Eric Christian. "Are Cosmic Rays Electromagnetic radiation?". NASA. Retrieved 2012-12-11. ^ Gaensler, Brian (November 2011). "Extreme speed". COSMOS (41). ^ L. Anchordoqui, T. Paul, S. Reucroft, J. Swain; Paul; Reucroft; Swain (2003). "Ultrahigh Energy Cosmic Rays: The state of the art before the Auger Observatory". ^ a b "What are cosmic rays?". NASA, Goddard Space Flight Center. Retrieved 31 October 2012. ^ D. Pacini (1912). "La radiazione penetrante alla superficie ed in seno alle acque". Translated and commented in A. de Angelis (2010). "Penetrating Radiation at the Surface of and in Water". Nuovo Cimento VI/ 9 (1912) 3 (93). ^ a b c "Nobel Prize in Physics 1936 – Presentation Speech". Nobelprize.org. 1936-12-10. Retrieved 2013-02-27. ^ V.F. Hess (1936). "The Nobel Prize in Physics 1936". ^ V.F. Hess (1936). "Unsolved Problems in Physics: Tasks for the Immediate Future in Cosmic Ray Studies". Nobel Lectures. ^ a b Kerr, Richard (31 May 2013). "Radiation Will Make Astronauts' Trip to Mars Even Riskier". ^ a b Zeitlin, C.; Hassler, D. M.; Cucinotta, F. A.; Ehresmann, B.; Wimmer-Schweingruber, R. F.; Brinza, D. E.; Kang, S.; Weigle, G. et al. (31 May 2013). "Measurements of Energetic Particle Radiation in Transit to Mars on the Mars Science Laboratory". ^ a b Chang, Kenneth (30 May 2013). "Data Point to Radiation Risk for Travelers to Mars". ^ Clay, J. (1927). "Title unknown". Proceedings of the Section of Sciences, Koninklijke Akademie van Wetenschappen te Amsterdam 30: 633. ^ Bothe, Walther and Werner Kolhörster (November 1929). "Das Wesen der Höhenstrahlung". Zeitschrift für Physik 56 (11–12): 751–777. ^ Rossi, Bruno (August 1930). "On the Magnetic Deflection of Cosmic Rays". Physical Review 36 (3): 606. ^ Johnson, Thomas H. (May 1933). "The Azimuthal Asymmetry of the Cosmic Radiation". Physical Review 43 (10): 834–835. ^ Alvarez, Luis; Compton, Arthur Holly; Compton (May 1933). "A Positively Charged Component of Cosmic Rays". Physical Review 43 (10): 835–836. ^ a b Rossi, Bruno (May 1934). "Directional Measurements on the Cosmic Rays Near the Geomagnetic Equator". Physical Review 45 (3): 212–214. ^ a b Freier, Phyllis et al. ; Lofgren, E.; Ney, E.; Oppenheimer, F.; Bradt, H.; Peters, B. (July 1948). "Evidence for Heavy Nuclei in the Primary Cosmic radiation". Physical Review 74 (2): 213–217. ^ J.L. DuBois, R.P. Multhauf, C.A. Ziegler (2002). The Invention and Development of the Radiosonde. Smithsonian Studies in History and Technology 53. ^ S. Vernoff (1935). "Radio-Transmission of Cosmic Ray Data from the Stratosphere". ^ Clark, G.; Earl, J.; Kraushaar, W.; Linsley, J.; Rossi, B.; Scherb, F.; Scott, D. (1961). "Cosmic-Ray Air Showers at Sea Level". Physical Review 122 (2): 637. ^ Auger Project. "Auger Observatory: A New Astrophysics Facility Rises from the Pampa". Pierre Auger Observatory. Auger Project. Retrieved 2013-04-29. ^ Kraushaar, W. L et al. (1972). "Title unknown". The Astrophysical Journal 177: 341. ^ Baade, W.; Zwicky, F. (1934). "Cosmic Rays from Super-novae". Proceedings of the National Academy of Sciences of the United States of America (National Academy of Sciences) 20 (5): 259–263. ^ Babcock, H. (1948). "Magnetic Variable Stars as Sources of Cosmic Rays". Physical Review 74 (4): 489. ^ Sekido, Y.; Masuda, T.; Yoshida, S.; Wada, M. (1951). "The Crab Nebula as an Observed Point Source of Cosmic Rays". Physical Review 83 (3): 658. ^ Hague, J. D. (July 2009). "Proceedings of the 31st ICRC, Łódź 2009". International Cosmic Ray Conference. Łódź, Poland. pp. 6–9. Retrieved 17 March 2013. ^ Hague, J. D. (July 2009). "Proceedings of the 31st ICRC, Łódź 2009". International Cosmic Ray Conference. Łódź, Poland. pp. 36–39. Retrieved 17 March 2013. ^ Adriani, O.; Barbarino, G. C.; Bazilevskaya, G. A.; Bellotti, R.; Boezio, M.; Bogomolov, E. A.; Bonechi, L.; Bongi, M.; Bonvicini, V.; Borisov, S.; Bottai, S.; Bruno, A.; Cafagna, F.; Campana, D.; Carbone, R.; Carlson, P.; Casolino, M.; Castellini, G.; Consiglio, L.; De Pascale, M. P.; De Santis, C.; De Simone, N.; Di Felice, V.; Galper, A. M.; Gillard, W.; Grishantseva, L.; Jerse, G.; Karelin, A. V.; Koldashov, S. V.; Krutkov, S. Y. (2011). "PAMELA Measurements of Cosmic-Ray Proton and Helium Spectra". Science 332 (6025): 69–72. ^ Mewaldt, R.A., 2010. "Cosmic Rays". ^ Koch, L.; Engelmann, J. J.; Goret, P.; Juliusson, E.; Petrou, N.; Rio, Y.; Soutoul, A.; Byrnak, B.; Lund, N.; Peters, B.; Engelmann; Goret; Juliusson; Petrou; Rio; Soutoul; Byrnak; Lund; Peters (October 1981). "The relative abundances of the elements scandium to manganese in relativistic cosmic rays and the possible radioactive decay of manganese 54". Astronomy and Astrophysics 102 (11): L9. ^ Moskalenko, I. V.; Strong, A. W.; Ormes, J. F; Potgieter, M. S. (January 2002). "Secondary antiprotons and propagation of cosmic rays in the Galaxy and heliosphere". The Astrophysical Journal 565 (1): 280–296. 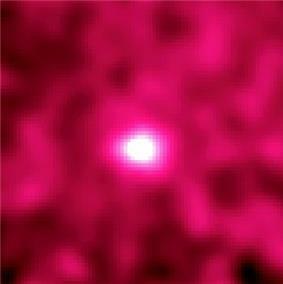 ^ "EGRET Detection of Gamma Rays from the Moon". ^ Morison, Ian (2008). Introduction to Astronomy and Cosmology. John Wiley & Sons. p. 198. ^ "Extreme Space Weather Events". ^ "Pierre Auger Observatory". Auger.org. Retrieved 2012-08-17. ^ D. Lal, A.J.T. Jull, D. Pollard, L. Vacher; Jull; Pollard; Vacher (2005). "Evidence for large century time-scale changes in solar activity in the past 32 Kyr, based on in-situ cosmogenic 14C in ice at Summit, Greenland". ^ "The Detection of Cosmic Rays". Milagro Gamma-Ray Observatory. Los Alamos National Laboratory. 3 April 2002. Retrieved 22 February 2013. ^ "What are cosmic rays?". Michigan State University National Superconducting Cyclotron Laboratory. Retrieved 23 February 2013. ^ R.L. Fleischer, P.B. Price, R.M. Walker (1975). Nuclear tracks in solids: Principles and applications. ^ "Cloud Chambers and Cosmic Rays: A Lesson Plan and Laboratory Activity for the High School Science Classroom". ^ Chu, W.; Kim, Y.; Beam, W.; Kwak, N. (1970). "Evidence of a Quark in a High-Energy Cosmic-Ray Bubble-Chamber Picture". Physical Review Letters 24 (16): 917. ^ Letessier-Selvon, Antoine; Stanev, Todor. "Ultrahigh energy cosmic rays". Reviews of Modern Physics 83 (3): 907–942. ^ CRAYFIS detector array paper. ^ "Natürliche, durch kosmische Strahlung laufend erzeugte Radionuklide" (in Deutsch). Retrieved 2010-02-11. ^ Cosmic rays may have hit Qantas plane off the coast of North West Australia, News.com.au, 18 November 2009. Retrieved 19 November 2009. ^ Ney, Edward P. (14 February 1959). "Cosmic Radiation and the Weather". 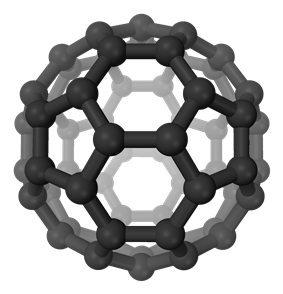 Nature 183 (4659): 451–452. ^ Dickinson, Robert E. (December 1975). "Solar Variability and the Lower Atmosphere". Bulletin of the American Meteorological Society 56 (12): 1240–1248. ^ Anderegg, William R. L.; Prall, J. W.; Harold, J.; Schneider, S. H. (21 June 2010). "Expert credibility in climate change". Proceedings of the National Academy of Sciences of the United States of America 107 (27): 12107–12109. ^ Long, Marion (25 June 2007). "Sun's Shifts May Cause Global Warming". ^ Plait, Phil (31 August 2011). "No, a new study does not show cosmic-rays are connected to global warming". ^ Sloan, T.; Wolfendale, A.W. (November 7, 2013). "Cosmic rays, solar activity and the climate". Anderson, C. D.; Neddermeyer, S. H. (1936). 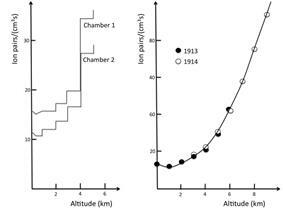 "Cloud Chamber Observations of Cosmic Rays at 4300 Meters Elevation and Near Sea-Level". Phys. Rev 50: 263. Boezio, M. et al. (2000). "Measurement of the flux of atmospheric muons with the CAPRICE94 apparatus". Phys. Rev. D 62: 032007. Kremer, J. et al. (1999). ", Measurement of Ground-Level Muons at Two Geomagnetic Locations". Phys. Rev. Lett. 83: 4241. Neddermeyer, S. H.; Anderson, C. D. (1937). "Note on the Nature of Cosmic-Ray Particles". Phys. Rev. 51: 844. Taylor, M.; Molla, M. (2010). "Towards a unified source-propagation model of cosmic rays". Pub. Astron. Soc. Pac. 424: 98. Ziegler, J. F. (1981). "The Background In Detectors Caused By Sea Level Cosmic Rays". Nuclear Instruments and Methods 191: 419. Carlson, Per; De Angelis, Alessandro (2011). "Nationalism and internationalism in science: the case of the discovery of cosmic rays". Padilla, Antonio (Tony). "Where do Cosmic Rays come from?". Sixty Symbols.